ACCOMMODATION: UPPER LEVEL: Kitchen, Lounge, Double Bedroom with built in wardrobes, air conditioning and en-suite, Two Double Bedrooms, Family Bathroom, Inner Hallway, Enclosed Naya EXTERNAL STEPS DOWN TO: Lounge, Kitchen, Enclosed Naya/Dining Area, Family Bathroom, Two Double Bedrooms with air conditioning, Inner Hallway, OUTSIDE: Terraces, Driveway, 8 x 4 Kidney Pool, Lawned garden, storage. 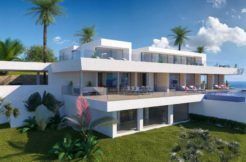 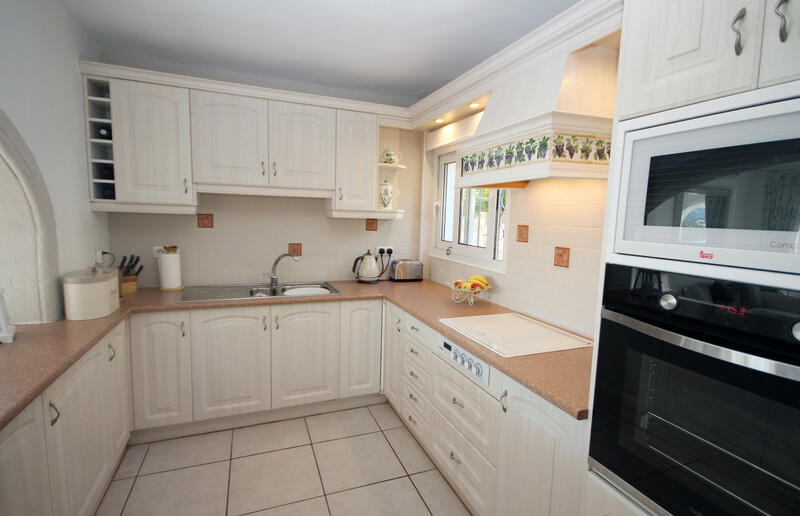 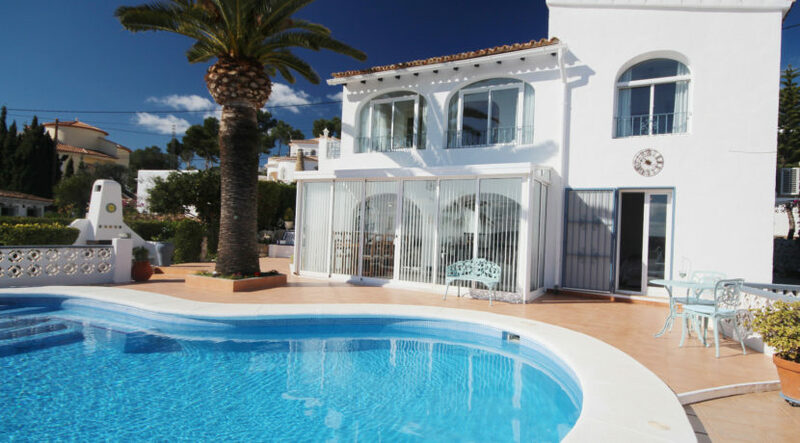 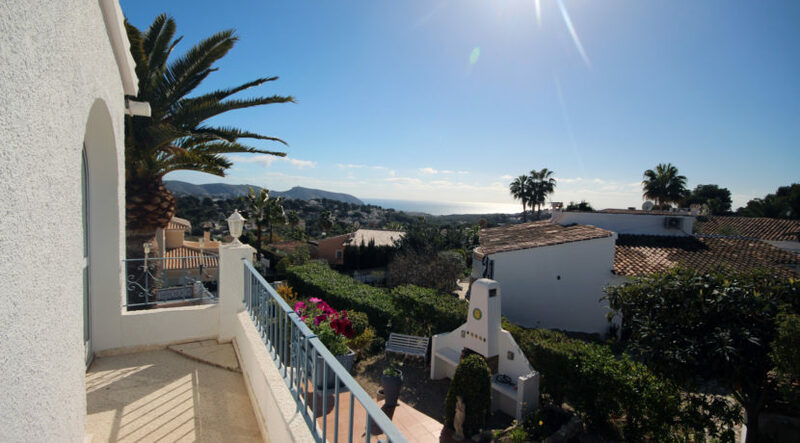 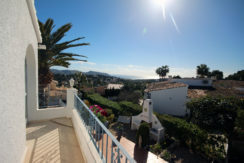 A delightful large villa in Benimeit, Moraira, divided into two apartments with five bedrooms in total. 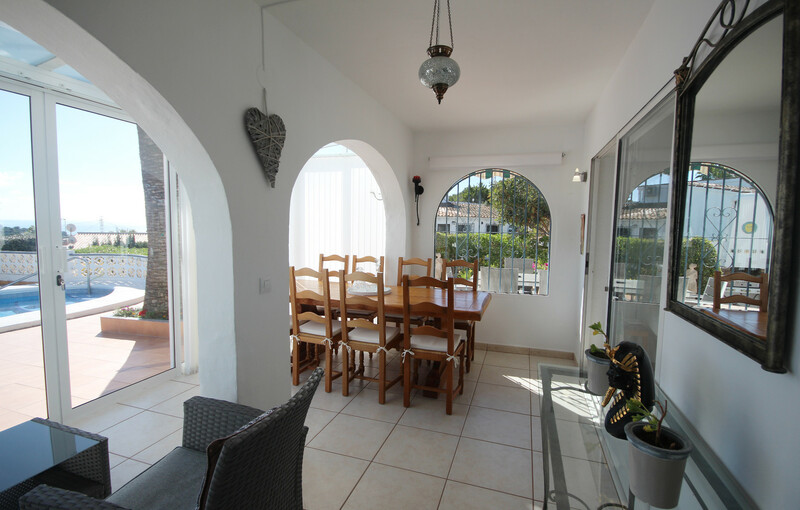 This walled property with stone arched gated entrance has a vehicular gate to the driveway with parking for one car. 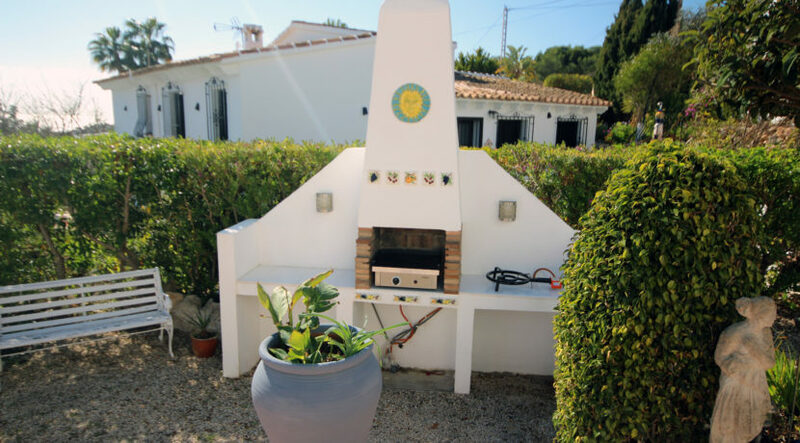 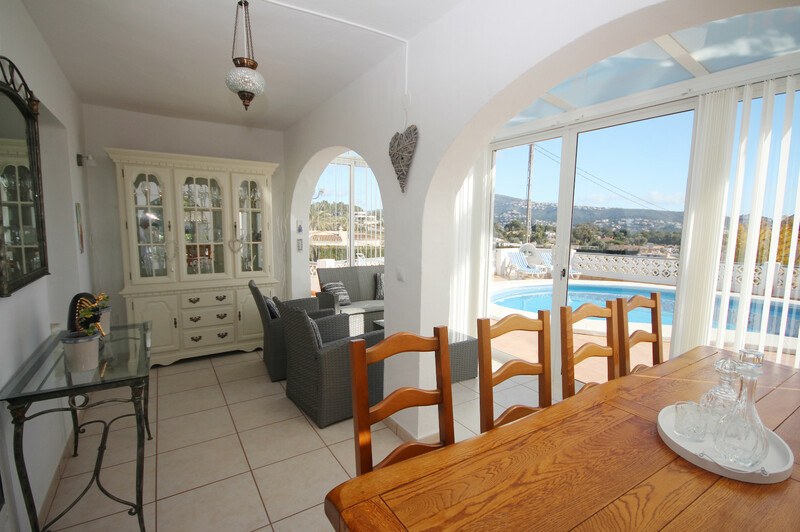 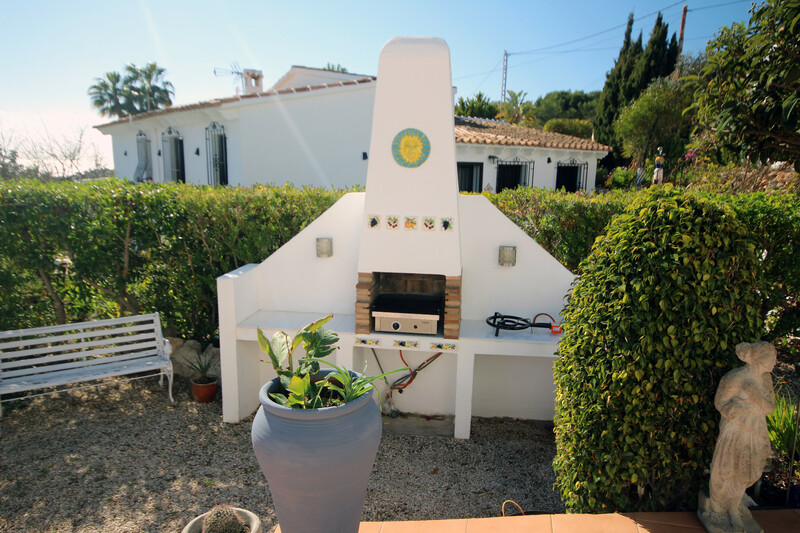 There are steps down to the main accommodation through well maintained terraced and gravelled gardens with a seating area and retractable persiana. 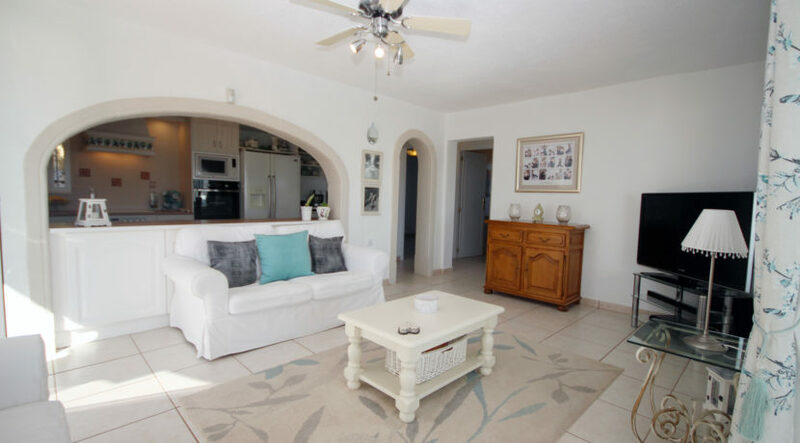 The entrance opens to the lovely light lounge which has a ceiling fan and air conditioning and leads to the fully enclosed naya/dining area fitted with patio doors opening to the pool. 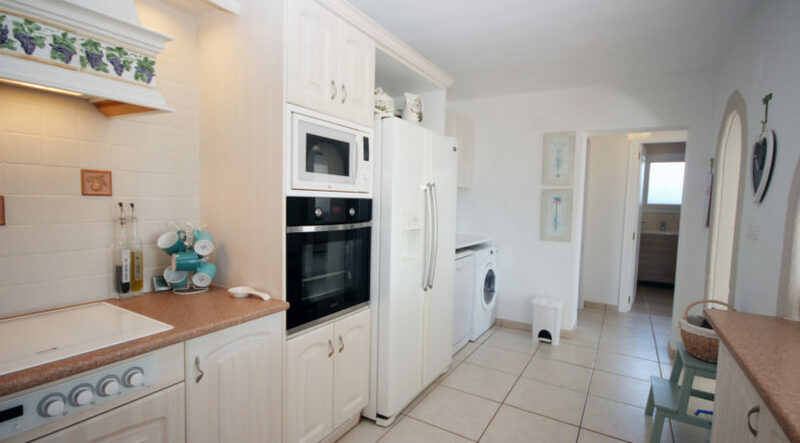 There is an arched hatch to the kitchen, which is fully fitted with a melanine worktop, integrated electric oven, gas hob, extractor, fridge freezer, washing machine, dishwasher and extensive storage cupboards. 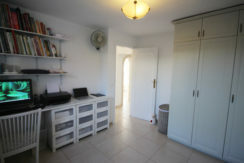 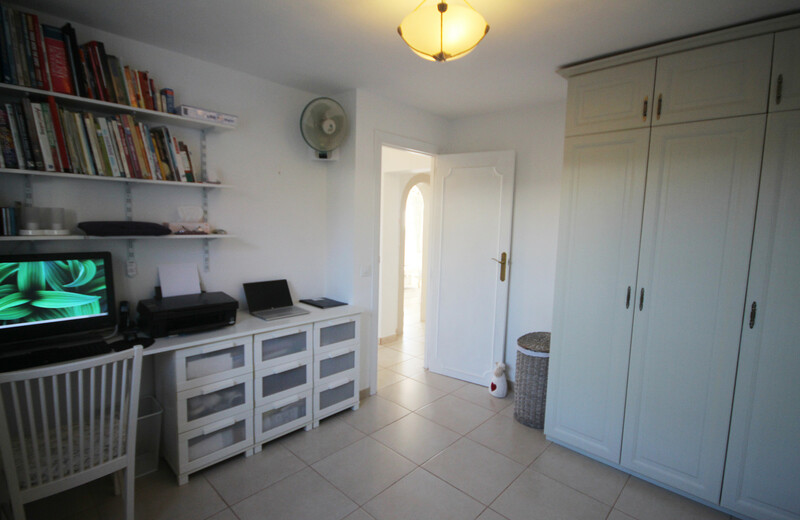 An inner hallway leads to the first double bedroom, currently being used as an office, has fitted wardrobes and an electric heater. The fully tiled family bathroom is very modern with a w.c., walk-in shower, vanity unit and basin. 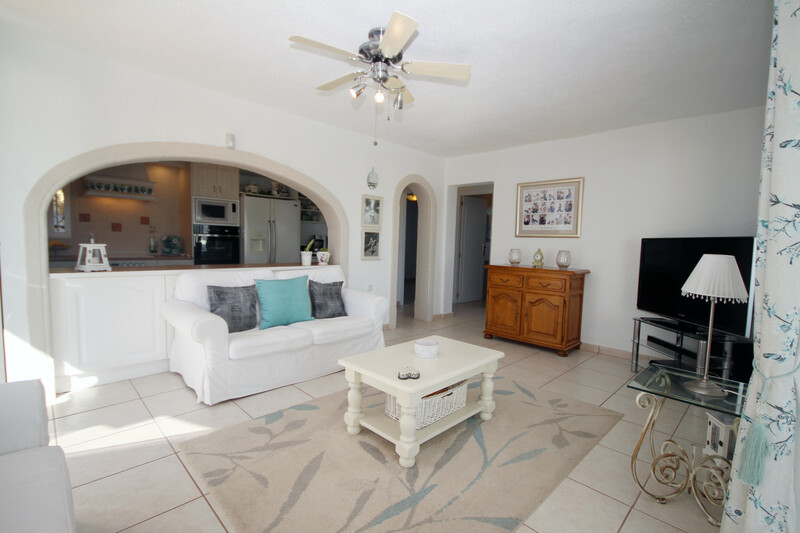 To the right is bedroom two, which also has air conditioning and patio doors opening to the pool area. The upstairs accommodation is reached either from the driveway or by external steps from the lower level. 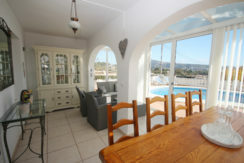 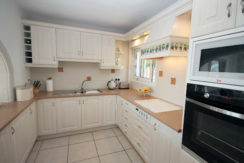 It has a wonderful galley terrace offering really good sea and valley views. 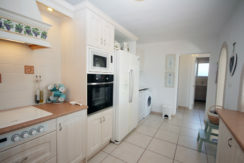 The door opens to the kitchen, with beams, which has an electric oven, gas hob, extractor fan, fridge with microwave on top. 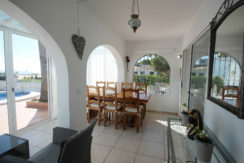 Through an arch to the lounge, also with a beams, and a stone open fireplace with a brick effect arch to the enclosed naya looking out to the sea. 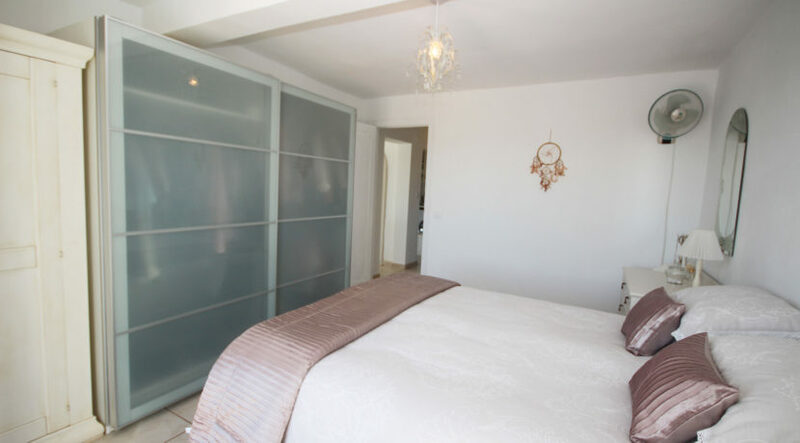 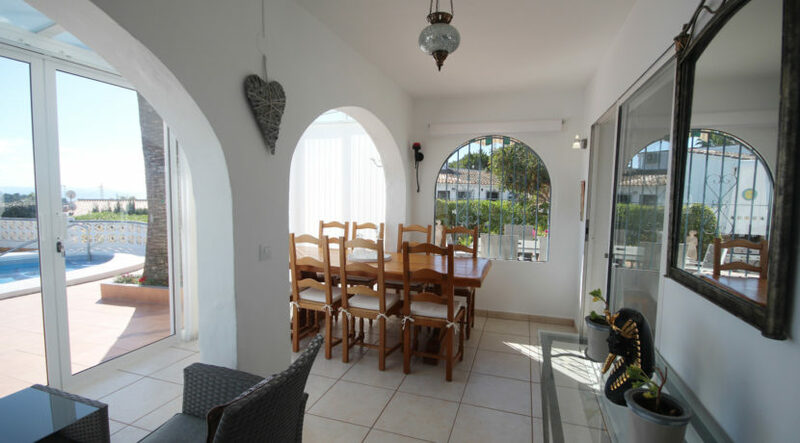 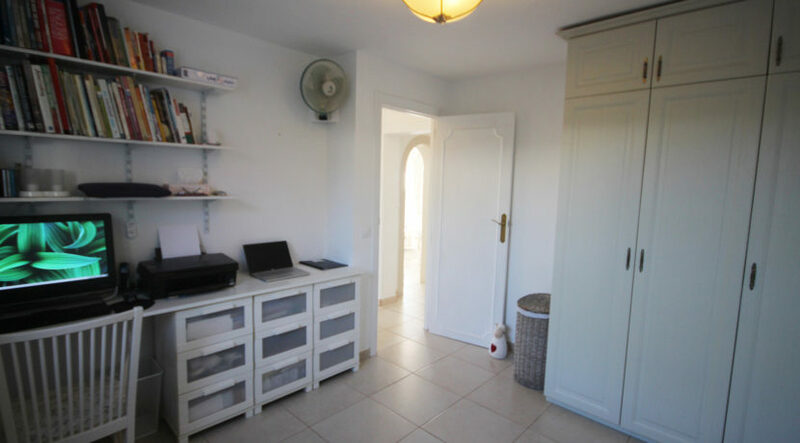 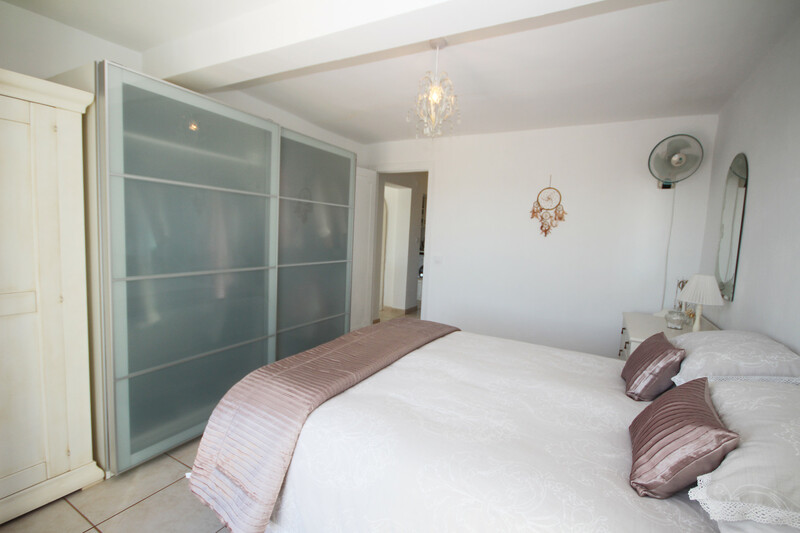 The inner hallway leads to the third double bedroom which has air conditioning, views to the sea and an en-suite with tiled walk-in shower with seat, w.c., pedestal basin and a mirrored cabinet. 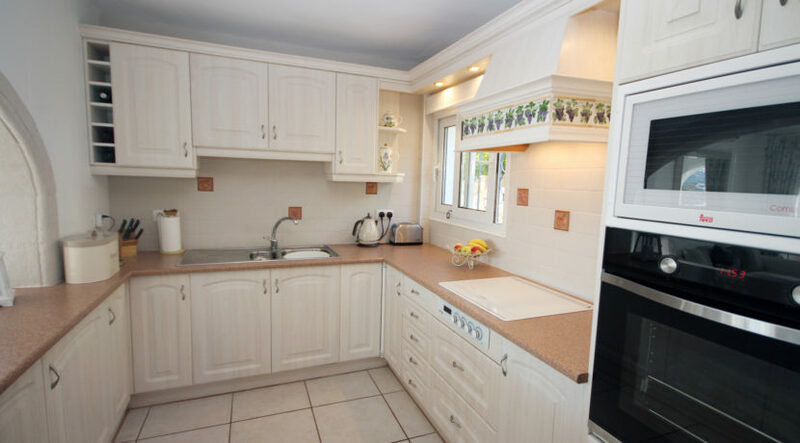 The family bathroom has a beamed ceiling, w.c., walk-in shower and a mosaic tiled vanity unit with a basin and a mirror above with fitted lights. 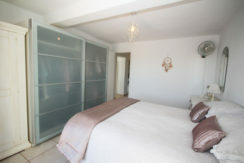 There are two more double bedrooms. There are wonderful outside areas with terraces, 8 x 4 m pool, BBQ area, a lawned area with established trees and storage area beneath the pool. 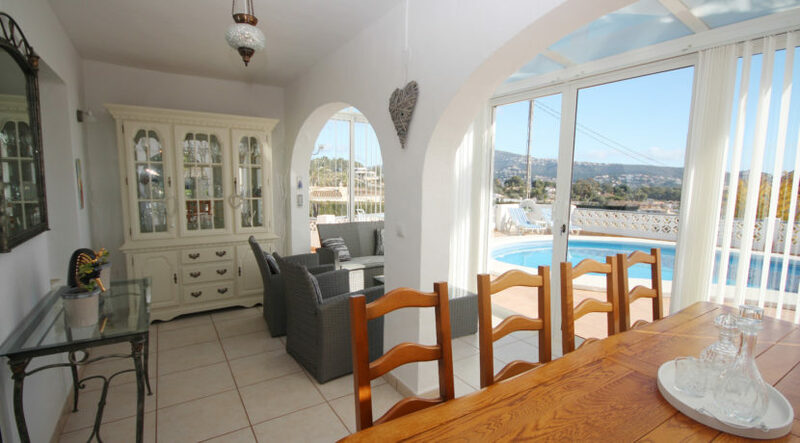 The villa offers substantial accommodation in a private setting with the most wonderful views.